13 Comments on "My Birthday Poem"
First off Happy belated birthday. You are one of the most interesting and awesome person I have come across in years. God bless you and I hope you are given many more years to teach, surprise, grow and shock us all. Keeping it fresh, honest and real. Thank you sincerely from the bottom of my heart. You are such a joy to me. I would love to buy your cookbooks. Where do I go to find them? Thank you for the free recipes you offer to all of us. 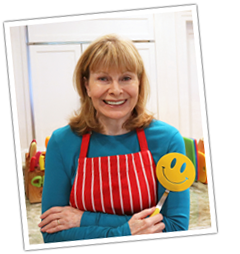 Thank you and please see the FAQs about my cookbook. I watched your TV shows back when lol and you have a flair for making us smile. Love the recipes, videos and humor in the kitchen! I wondered if you have an Air Fryer? They really gaining followers and wondered if you had or thought about one to play with. They really are fun. But more recipe ideas is always fun to get. Just food for thought. Thank you for the recipe postings, videos and your time to do all. Happy Belated Birthday! I loved the poem, I’m going to save it on my dressing mirror, so as I see my aging reflection, I can see your positive poem about aging! I very much enjoy your youtube videos, and your website and blog. I just found them recently, and have shared them with my family and friends. I’ll be 62 this summer, and I have been realizing all the things you’ve mentioned in your poem. I love to cook and bake, like you. It is healthier than eating out all the time. Love your recipes and am glad I had found you on the web a month or so ago! Lovely poem, what you describe in the poem is a life style choice, one that I personally changed to after my heart attack 11 yrs and 7 months ago, when I was only 45 yrs of age. Thank you for all you do and share. Also, congrats on another year of life!! Really enjoy your YOU TUBE channel. Will you have any recent videos to share? You are a wonderful cook and lady. Happy Birthday. Know how you are feeling, I turn 73 in July. Wishing you many more years of health and happiness. Thanks for sharing all your wonderful recipes. I really am enjoying them. Now that I have the time do the things I put off while working, I love baking bread, never had time when I worked. Thanks again and Happy Happy Birthday. Happy Birthday! I just googled you because I absolutely DO NOT believe you could be 72!! Wow!! You go, girl! FYI, one of my nephews is marrying his long-time girlfriend in August. They are late 20-s and own their own home and therefore already have pretty much everything they need. SO… what to gift them? Well, I decided to put together a recipe book similar to the one I made for myself years ago. It is easily customizable and only contains the recipes I absolutely love. MANY are your recipes!! The binder is separated by divider tabs for categories and the recipes are printed out on computer paper and slipped into sheet protectors. I put sticky notes on some I know she’ll love but might not make for herself, thinking they aren’t healthy enough! Like your Boston Cream Pie. Like your Meatloaf. OMG, we all love your meatloaf!! Anyway, I still can’t belief that your 72, which just makes your case that eating healthy and moderate exercise and a few good choices really does make all the difference! Many blessings to you, Jenny! And thank you SO MUCH for making all of your wonderful recipes accessible to so many for FREE! (I still haven’t tried your doughnuts because I’m sure I’d need an intervention. haha!! Thank you for sharing all your healthy and wonderful recipes. You kindness and your funny personality is beautiful. Thank you for sharing your culinary gift. Thanks to you my family enjoys delicious healthy meals! Happy birthday to a wonderful lady. You’re such a sweet heart and caring person. Wishing you the best! Wishing you the ‘very best’ that life can offer! Keep up your excellent work and attitude. You make countless people both healthy and happy and so proud to say we are among them!! Wishing you a very happy birthday, Jenny!! !